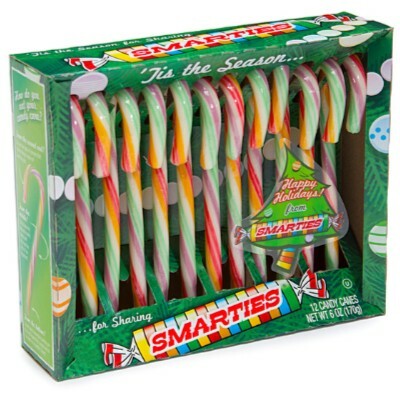 Get the sweet and tart flavor of your favorite Smarties candy in a festive new form when you get a 12 piece package of Smarties candy canes! 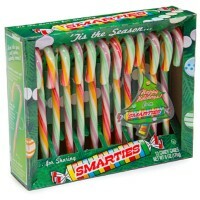 These beautiful pastel-colored treats could be a bright and cheery addition to your Christmas stockings, a unique tree decoration, or your perfect solution to you forgetting that today was your office Christmas party and you were supposed to bring something. Sugar, corn syrup, acidity regulator E330-E296, artificial flavor, colors E129*-E133-E102*. *May have an adverse effect on activity and attention in children. Nutrition facts (for 100g): calories 375Kcal, total fat 0g (saturated fat 0g), total carbohydrate 100g (sugar 75g), protein 0g, salt 0g.